Wood Inlaid (Moaragh) is the art of substitution of the different parts of a design by colored pieces of wood and integrating them with each other in order to decorate the surface of a tableau or other wooden understructures. Although the beginning of the emergence of this art is unknown, but it seems that India is the main birthplace of this art. 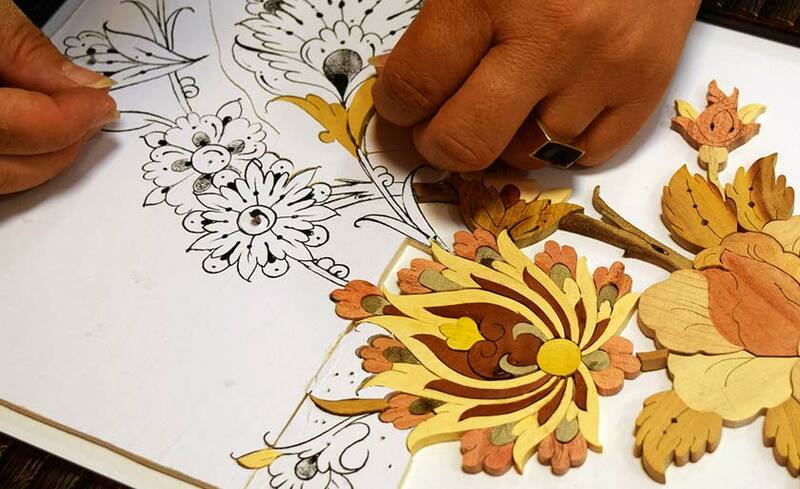 The origin of wood inlaid working in Iran has stemmed from the art of inlaid working on tile which has emerged in the late Ilkhani Period and after Timurid Period. 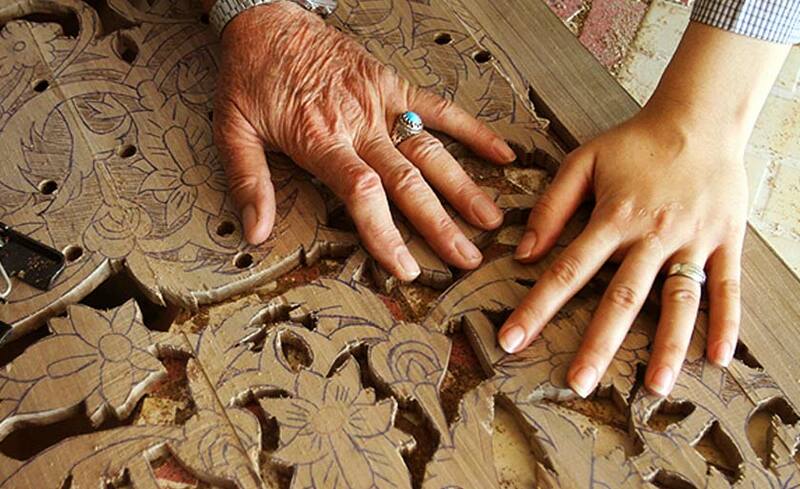 Lexically Inlaid (Moaragh) means a set comprised of tiny pieces joined together to form a mechanism. In wood inlaid working, according to the delicacy and complication of the design, different pieces of wood with a high variety of colors and also shell, bone and metal are used in order to improve the quality of the manifestation of the work. In order to implement the job, the design is stuck to a three-ply piece of board and based on its lines all the pieces are numbered, then very carefully cut by means of a coping saw and every piece is used as a pattern for cutting desired wood. The three-ply board is connected to the main piece of wood by very tiny nails in such a way that after sawing round the wood, the pattern board and the wood may be easily separated. Having completed the design, the background can also be filled with wooden texture or colored polyester. In Isfahan the background like the design is substituted with colored woods. Finally, the work is polished so that a smooth surface is obtained. 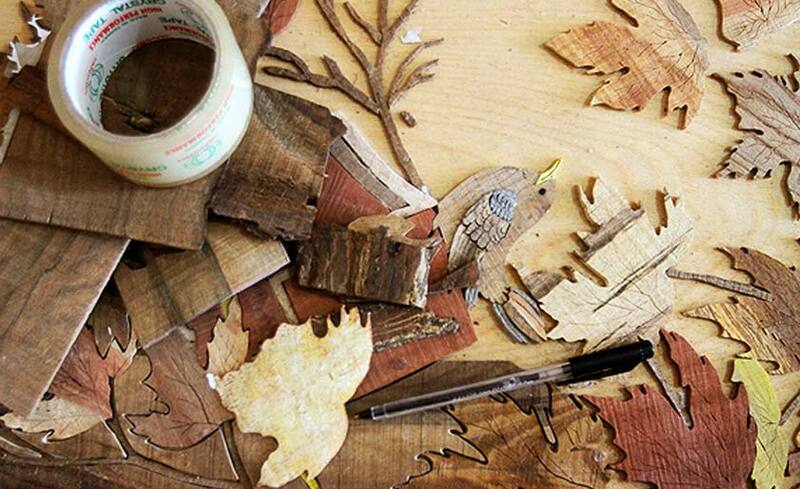 In order to fill the spaces among the cracks, wood glue and filler with the same color as that of the work is used. The cleaner the cutting of the different parts of the design, the better the work-pieces are arranged next to each other with less crack space. Moreover, factors such as coloration, disappearance of the glue trace and nailed points and the strength of the understructure are very important in the valuation of the work. 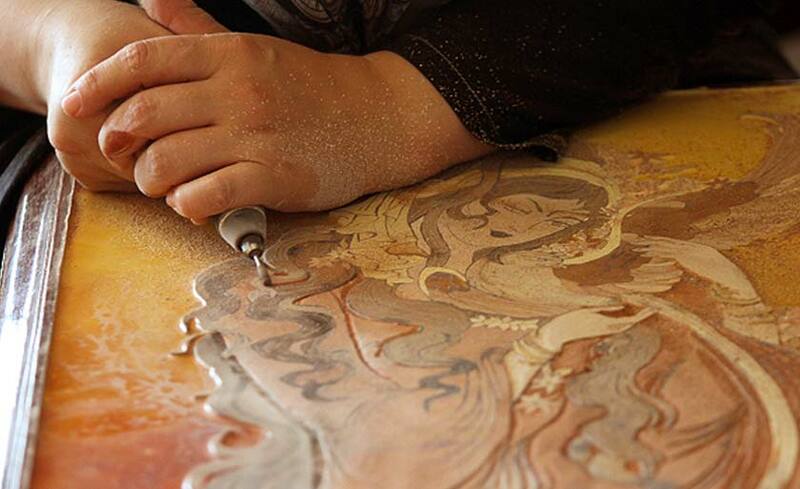 The object which has undergone inlaid working is covered by a coat of clear polyester in the final stage. Wood Inlaid working has different kinds such as wood inlaid-wood carving (Moaragh -Monabat) and wood inlaid working (Moaragh-khatam). 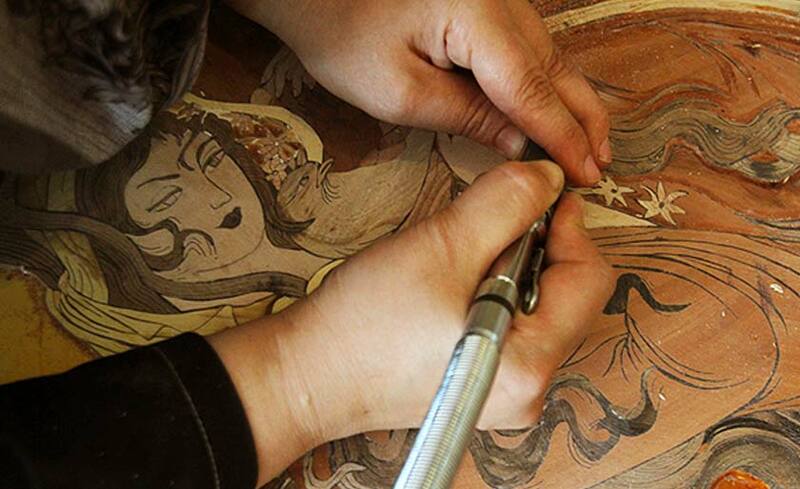 These are two techniques in which the objects undergone wood inlaid working process are also decorated by combination of wood carving or inlaid (khatam) pieces.